You are here:Home / Curiosity / Could This Landscape Model be a Mental Health Aid? Could This Landscape Model be a Mental Health Aid? Designer Sam Phong Nguyen’s Oscillating Skyline model is a swaying landscape that helps restore mental balance. In the early 20th century, utopian architecture aimed not only to mirror the fractured complexities of modern life, but to transcend them and reshape the way we live. Today, we are searching for something more inward, more intimate and immediate: a way to soothe anxieties and ease the ongoing trauma of an erratic, violent world. 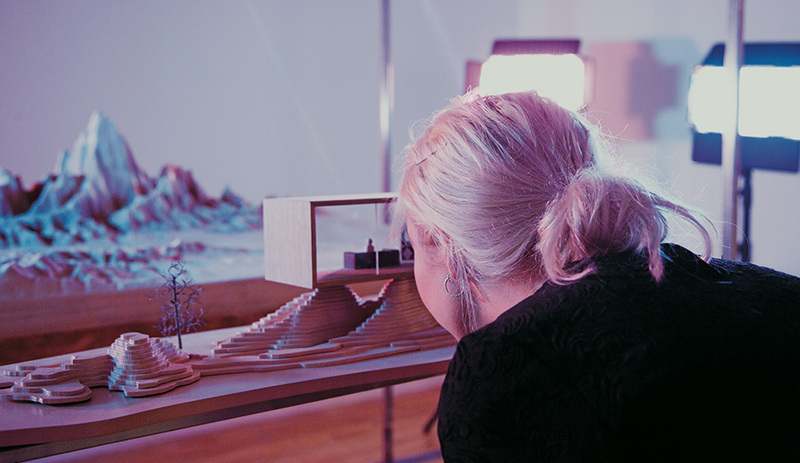 Experiential designer Sam Phong Nguyen suggests a remedy with Oscillating Skyline, a suspended scale model of an undulating, treeless mountainscape. Bathed in soft blue-and-purple light, this panorama rocks hypnotically back and forth in front of a viewfinder structured as a doll-size room, complete with a tiny figure keeping watch at the window. Crouched over to share this figure’s perspective, the viewer drifts into a penumbral and strangely alien world, attentive not so much to the landscape as to the gentle swaying motion, which simulates eye movement desensitization and reprocessing therapy. Intended simply as a “poetic vision of the future, where a more open society could develop new possibilities for mental health care,” Nguyen’s concept is just a model, not an alternate universe. It does, however, encourage a reconsideration of the foundations of architecture – both literal and theoretical. While moving the horizon may be an unrealistic design challenge, perhaps it is worth shifting our perspective – to the left and then to the right – to help bring a bit of order to an unbalanced world. Daniel Baird, a senior editor for the Canadian Encyclo­pedia , writes regularly about art and ideas.